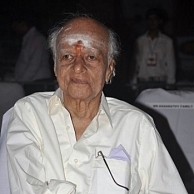 Legendary music composer and violin exponent TK Ramamurthy passed away today. He was 91. The legend was suffering from a brief illness and was admitted to a private hospital, where he breathed his last. TK Ramamurthy and MS Viswanathan were celebrated as the 'Mellisai Mannargal' and have worked together for over a decade and in over 700 films. We, at Behindwoods convey our deep condolences to the kith and kin of the departed and bow our heads to all the incomparable contributions he has made to the world of music.